In wandering around the internet, I found a great new site called Urban Cusp. The tagline for the site is Lifestyle. Faith. Culture. Social Change. On the site, I found an interesting perspective on how faith manifests itself in one person’s life, and within a specific community. The author, Lauren Maxwell, intertwines ministry, culture, history and activism, and shares her story in a memorable fashion. 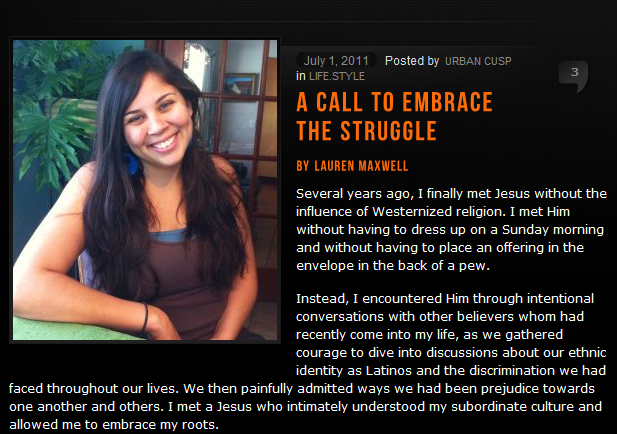 Visit: A Call to Embrace The Struggle to read the whole story. I found your blog through the September Woman’s Day magazine this afternoon. I immediately felt my mood be lifted as I read the article. And than I just had to stop by your blog. It’s now 6:30 pm here in Las Vegas and I cannot stop reading. It’s like I’m hunger for enlightment and you are providing the words of comfort. Rona, thank you so much for stopping by, and I can’t tell you how humbled I am to hear your kind words. I am so glad that my stories have provided comfort to you; I hope that you will come back and remain part of the “52 Weeks of Worship” community. The journey continues, and we can continue to support and bless each other. All the best to you!